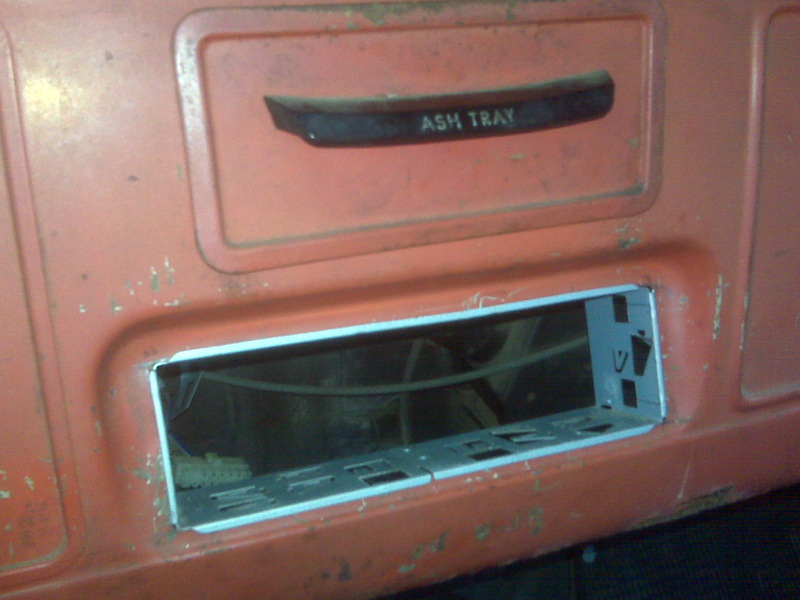 The 1965 Chevy C20 Blog | Rebuilding the past… only better. Rebuilding the past… only better. Ah – life! I’ve been so busy the last while, that I haven’t been keeping up with anything. I switched to Antique Plates, so no more inspections. On the bright side of this, my son now drives the truck more than I do and he LOVES keeping it in good running order. I moved the new hood I bought over to a pallet in the garage so it doesn’t get wet from rain that might sneak into the garage. Still planning to clean it up and paint it (once I have time). I still want to tear down the rear-end and check/replace the brakes, but I keep putting it off because I’ve never cracked open a 3/4 ton axle before. My son wants to make sure we have all the parts before we start, so that will take effort (small). My son (he’s 19 now btw) – just replaced the speedometer cable with a brand spanking new one. I put a link on my info page. That’s about it! Hope everyone had a great 2018 and will have a great 2019! I think that’s about it. We’ll probably finish that up this week and take it up on Monday. Did a quick tune-up today. Switched wires, plugs, oil filter, oil, and air filter. I don’t notice it running any better, but it wasn’t running bad in the first place. I bought a seat cover too, but didn’t put it on yet. On the horizon, I ordered a C20-C10 cab mount conversion kit from Brother’s Trucks. We’re hoping that will fix the leaning issue it’s had since we bought it. Also ordered hinges for the tailgate. It’s about time I got moving with that. 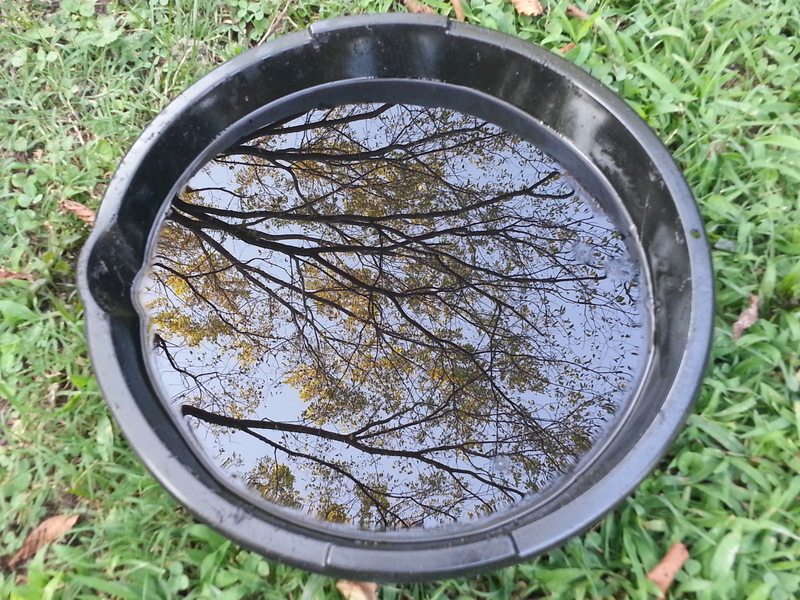 And old oil – eeew! I swear I should post pictures. 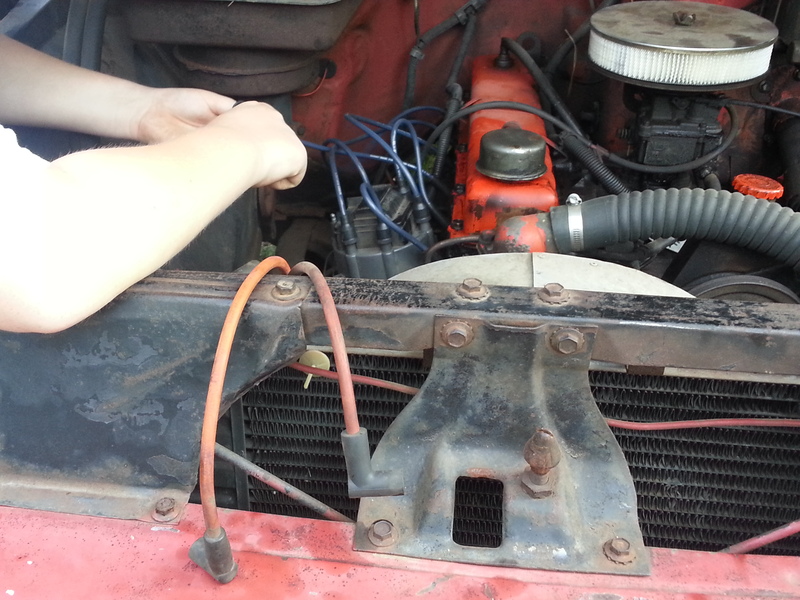 Today we changed the distributor cap and rotor. It was a quick maybe 30 minute job. It actually took longer for the auto parts person to figure out what we had. He thought he had it pegged but when we compared it, it was way off. He cross checked the number to BWD P-Series parts. The cap I have is a BWD P-Series part C198P (I’ll put that on my parts page) and the rotor is also a BWD P-Series D157P. I’d never changed it before since buying the truck and when idling, you can just about hear it missing at least one cylinder if not always, then most of the time. The new one doesn’t seem to do that, so we may be good to go. I think we changed the plugs about a year and a half ago. I’ll add a tune-up page so I can keep track of that and I’ll add these to the parts page. I think this is the 3rd inspection I’ve had. I always think I’ll get it inspected and then have to park it in the backyard for six months while I work on it, but so far it’s never that bad. I knew about everything beforehand except for the muffler. Nothing is easy, though. I could only find the hoses online so I ordered them today and they should be here on Tuesday (thank you, Amazon!). We went to three places until I found a comparable muffler. The one on there was a “Cherry Bomb” so the guy before me must have been a muffler enthusiast. I just bought a Thrush because I’m all about cheap. My son and I got it on there but there is a slight leak so I stuffed the area full of JB Weld and hopefully we’ll be good to go. Oh, and I looked the engine up. As far as I can tell, it is from a 1970 Chevy Camaro. It’s a 250, at least, that is what the code on the engine suggests and so far, the power steering and muffler match that car. Hello all! Since I have new followers, the least I could do is post something. Not much activity over the last x months. I drive my truck every day to work and only recently have finally dared to take it on the interstate. I’m lucky that my work isn’t that far away and I don’t avoid the interstate for safety reasons, mostly because I like to drive slower anyway. You’d think I was 70. 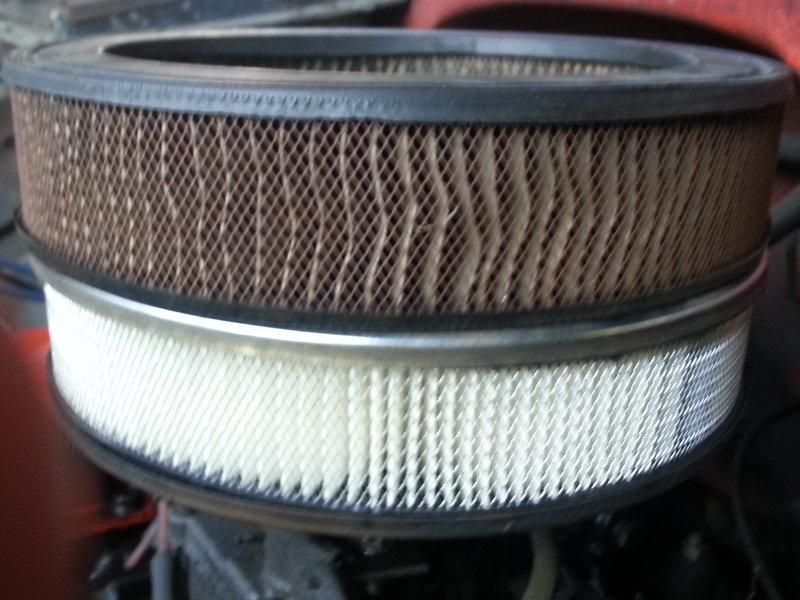 I have this glass gas filter right near my carburetor and it was starting to get filled with trash. It’s built up over time and I have no idea when/if the last owner changed it so I decided to get one. I went to the auto parts store and since the truck is obviously a mixture in various ways of different years, it’s often hard to tell them exactly what I have. 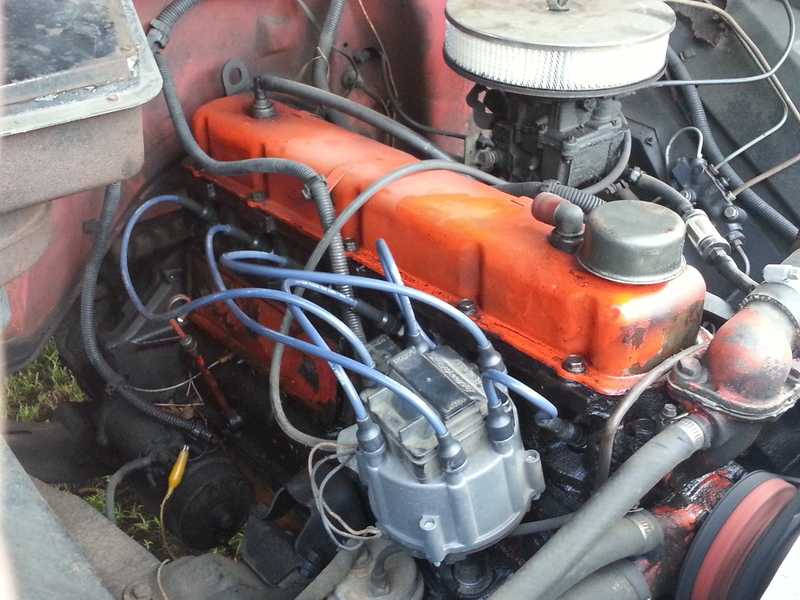 I know it’s a 1965 C20, but the engine is out of something else. I actually looked it up and I’ll document it here once I look it up again. Anyway, he looked it up and didn’t see anything resembling what I had, so he came out and looked at it and immediately recognized that he had one – turns out, EXACTLY like mine. Excellent – my son and I changed it and now I feel a little better about my gas flow. 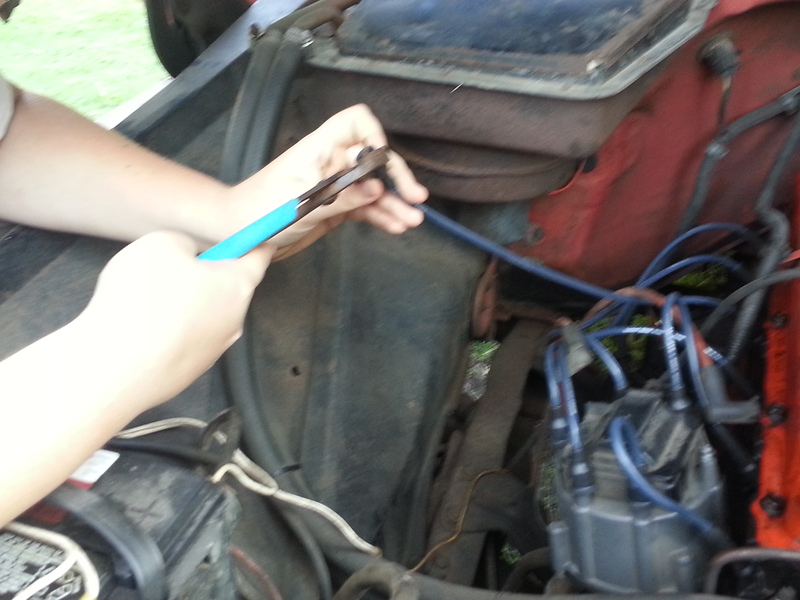 We also tightened up the alternator belt and re-attached the ground wire on the left front turn signal. I always cringed when it rained and I needed to turn on my lights and the signal light would just glow. We found the loose ground wire and it’s all better now. My left front spring needs replacing. I used to think this was a cab support causing my truck to lean, but the leaning is getting worse and I am pretty sure it’s the spring. Amazon has two new springs for about $75 – hurray. Replace the rear brakes. I don’t look forward to this, but I’m more confident than I used to be after hearing from so many other owners who’ve already done it. My right front tire was getting a little too bare to pass inspection so I went by the used tire place to get a tire and I was greeted with “Loads of Laughter”. It’s not crazy for me to go there, since that is where I bought my last one and it was fantastic. Now that I needed another, I was reassured just how difficult it is to come by one of these second hand. I had already checked a few of the local new tire places and a 16.5 x 9.5 tire runs around $250+ – which is 1/6 the price of the truck. Nope, don’t see it. They suggested I come back when the manager was there (he is who I dealt with the first time) and sure enough when I did, he had one. It was $70. I was about to sign on the dotted line when I asked what would happen in 6 months if I needed another tire and he said I’d probably go through the same ordeal. I’m not into “ordeals” so much (which makes you wonder why I picked this truck – but I picked this truck to avoid the ordeals associated with computers, air monitors, and automatic transmissions). I asked him if there were any other options and he suggested I swap out the rims, and he had two with tires. So I took off the two 16.5 x 9.5 rims/tires on the front and replaced them with 16 x 8.5 tires and rims. What’s cool is that I went to the Walmart tire site and there was many nice choices in this new size. I honestly don’t see a difference on the truck – it appears to be the same in all ways just that the nice rim I’d painted is sitting in the garage now. I’m thinking about selling it because the two tires with rims only cost $140 (total), so I could maybe sell these and buy two more for the back. The back has 16.5 x 12.5 – which actually makes the truck look like some hot rod and I actually like it enough that I haven’t jumped on swapping those out – plus the tread is in terrific shape. Hi Everyone! I’m still here. Once the truck passed inspection, I just started driving it everyday and haven’t worked on it as much. Maybe now that it’s getting cold, I can start parking it in the garage again and get back to business. I finally replaced my CD player. I know CD player sounds funny to some people – especially based on the age of the truck, and then again still some of you probably have one in yours. The truck came with one, which was funny to me. Probably not original equipment. It never worked right. 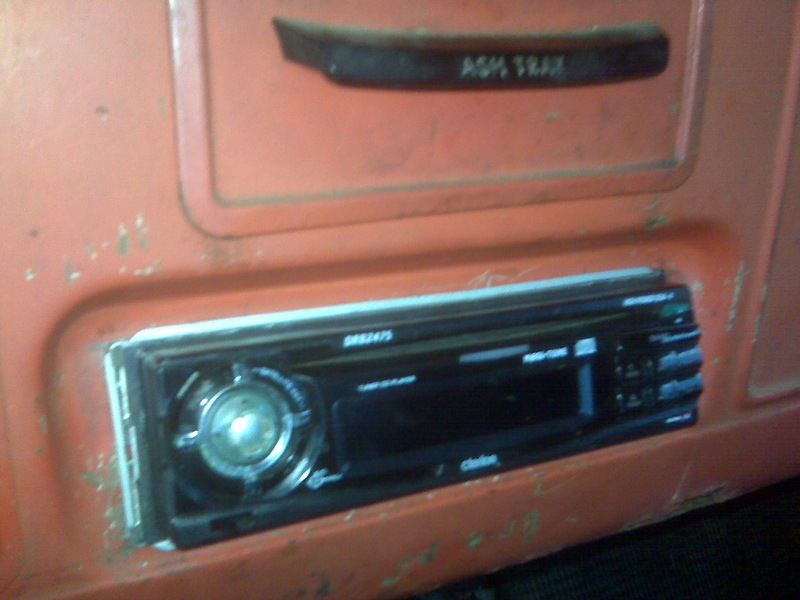 The radio would work, but it would not play CD’s and the reception was all screwed up. 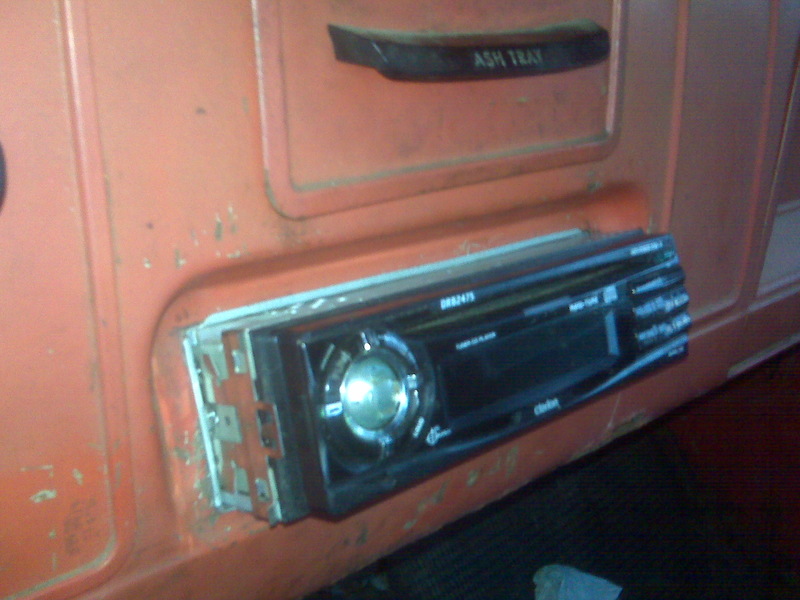 One day during lunch I went out to the garage and I knew I had an old CD player out of another car. To my surprise, it was the same brand as the one in there so changing it was actually a snap. I did it right during lunch. First I removed the wiring harness from the back – it just unplugs. Next, I loosened a bolt on the back and this released the radio. I was able to lift a clip and slide it right out of the dash. I then slid the new one into position. I reattached the wiring harness and antenna, then hooked the bracket back up and tightened the bolt. All I had left was snapping it back in place. Sounds great! I’m glad I saved it. It actually sat out in the garage for about 6 years so I’m glad it was still functioning. The next item to tackle on my list is the driver side front wheel brake. The inspection station said it was sticking. I removed the wheel and verified that the disc brake was not releasing. He said it was a hose. I went to NAPA and asked for a hose for it, where I found that a 1965 Chevy C20 does not have disc brakes. Hmm – really? Because I have them. Obviously they are off of something else. I pulled the caliper loose and took the number up to them to get a new hose. 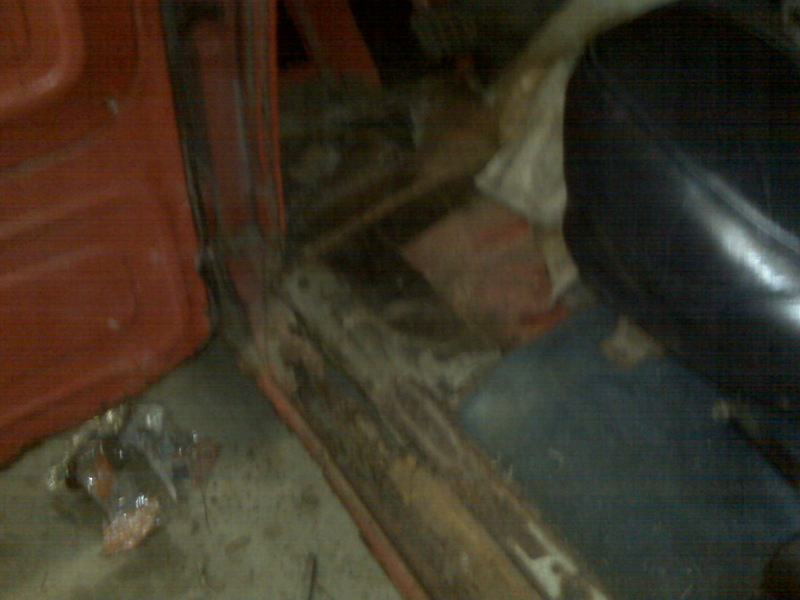 He said it is off of a 1973 C10. He, of course, doesn’t have one. He can order it. Now, I’d already been to AutoZone and they didn’t have any idea what the GM part number cross referenced to. I was impressed that NAPA immediately looked it up. Two days later, the hose arrived and I took mine up there, but it wasn’t the same. Their hose was a right hose that someone had put in a left box. He had to reorder. The next day I went back and now the hose was a left hose, but it doesn’t fit my caliper. The bolt is a different size. 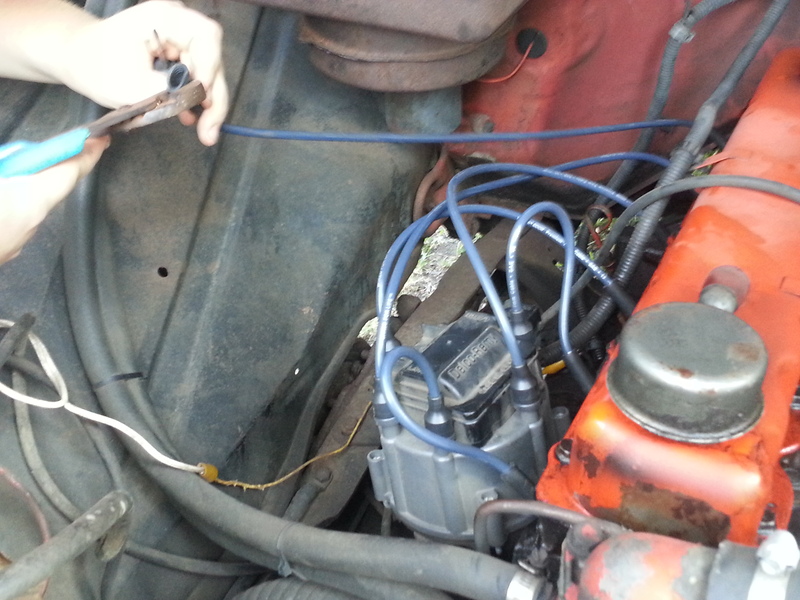 The guy typed for a while and came up with a 1975 C10 hose that fit just right. Terrific. I went home and put it all back together, but I was unable to remove the bleed fitting on my caliper. Even with vise grips, all I managed to do was destroy the fitting. So I went back to get a caliper. I priced it earlier and it was only $17, which is well within my tolerance for pain vs. throughput. He took out his caliper and it didn’t match mine. Same GM#, but it was different. The 3/8″ brake line was too big. This one looked like a 1/4. Everything else was exactly the same. I didn’t want to buy another hose, so he typed more and found the right caliper. I think it was off of a 1973 C10. I’m starting to feel like I’m in a Johnny Cash song. He had to order it. Two days later I picked up the new caliper, put it all back together and bled the brakes. I’m a little disturbed because even after all of this, the wheel still drags a bit. I’m not sure why. The caliper properly extends and retracts but you can hear the wheel pressing against the brake pads. The pads are also practically new, so I’m hoping they just need to wear in a bit. Maybe it’s a combination of surface rust on the rotor and new pads. Yeah, that’s it. We’ll see. So that’s 2 of 3 tasks. 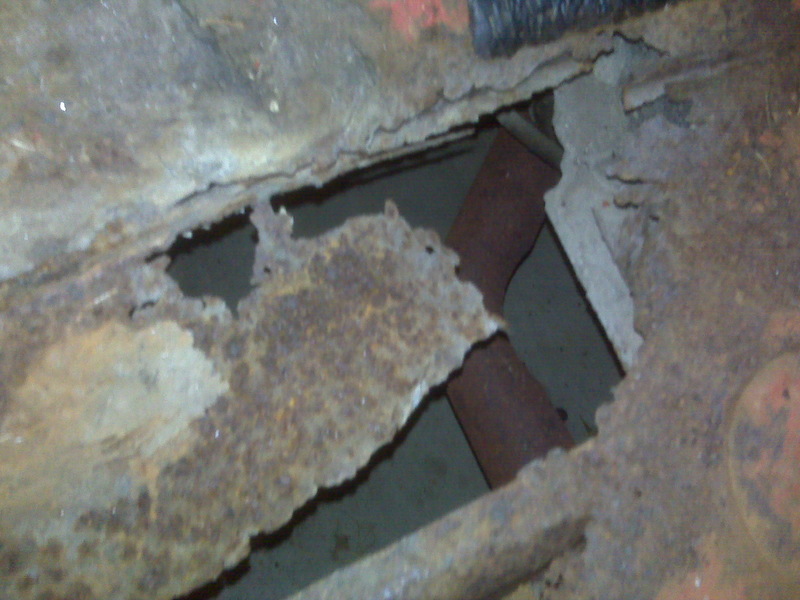 The next task to tackle is the gaping “Fred Flintstone” hole in my floor pan. I called Brother’s trucks yesterday and ordered a replacement pan and rocker for the drivers side. Looks like learning how to weld is in my near future. He was right, even though I thought surely he would not be. I had to cut here and there with the angle grinder and finally got the old U-Bolt off. That took a few days because I only have an hour or so that I can put towards the project in a day. At the same time this was going on, I had to find a u-bolt to replace the one I was cutting up. This was difficult also as none of the auto stores in my area have anything like this. I lucked out and found a local company that MAKES any size u-bolt you could imagine. They are also cheap – only about $10 per u-bolt. I know this because I had to buy three of them. Yes, this REALLY happened. I suspect because I am a moron, but between traffic and talking to people at auto parts stores who said repeatedly, “Surely, it’s 5/8″ and not 3/4″ – that’s just crazy talk!” The 3 1/2″ to 3″ last minute goof up is just me trying to rush between work and this place and not paying attention. Anyway – I finally got the trailing arm loose, then removed the emergency brake line and had to cut the bolt off of the spring and then use an air chisel to get the spring loose from the arm. FINALLY – it came off. The front bolt under the cab was a lot easier and then I was done. Next, I just had to reverse the process and put the new one back with all new bolts and my 3 versions of ubolts. Done! It looks great. We drove it around the yard a bit and it didn’t fall off, so I’m confident that part 1 of 3 of my “Inspection Challenge” is complete.